These commercial quality bleachers feature a 4' wide center aisle with mid-aisle handrails. 6061-T6 Aluminum alloy angle frame understructure is ideal for level sites. Attach to a concrete foundation or install with in-ground, earth anchors. Seat planks are constructed of 2"x10" nominal, extruded 6063-T6 aluminum alloy with a clear anodized finish. Tread planks are constructed of two 2"x10" nominal, extruded 6063-T6 aluminum alloy with a mill finish. End caps attached with tek screws. Riser planks are made of 1"x6" extruded aluminum alloy with a clear anodized finish for under each row. All seat and foot planks accommodate 200 plf across a 6' span with a maximum deflection of 9/16". Designed to support, in addition to their own weight, a uniformly distributed live load of not less than 100 psf of gross horizontal projection of the bleachers. Designed to resist, with or without a live load, a horizontal wind load of 30 psf of gross vertical projection. In addition to the live load, designed to resist sway forces of 24 plf of seat plank in a direction parallel to the length of the seat, and 10 plf of seat plank in a direction perpendicular to the length of the seat. Under tested loads, stresses in aluminum members and connections do not exceed those specified for Building Type Structures by the Aluminum Association. 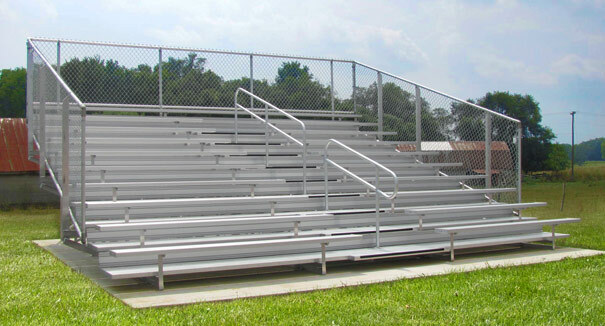 These bleachers are fully compliant with BOCA, IBC and ICC codes as of 1/1/2010. We recommend you anchor these units to a concrete pad, piers, etc. 4, 5, 8, 10, and 15 Row Units. 17" Front Row Seat Height. 2" x 10" Nominal Seat Planks. 15', 21', 27' & 33' Lengths. Towable (5, 8 & 10 Row Only). Chain Link or Vertical Picket Guardrail. Guardrail system protects all three sides of the bleacher and is available in your choice of chain link or vertical picket construction. The chain link railing is made of 1-5/8" anodized aluminum tubing with end caps at ends of straight runs and elbows at corners. All railing is secured to angle rail posts with galvanized fasteners. Tie-down assemblies consist of a 4-way adjustable aluminum clip, with galvanized nut and bolt and washer for each connection point at each support. The 2", 9 gauge galvanized chain link fencing is fastened in place with galvanized fittings and aluminum ties. Top of railing is 42" above the center of any adjacent seat. The guardrail system has no opening larger than 4" at any location more than 30" above grade including the triangular region underneath the seat formed by the tread and rise. It is the buyer's responsibility to check their local building and fire codes to determine the compliance requirements in your community.